The morphology and the genetic defects of the Neurospora crassa colonial temperature-sensitive-2, -4 and -5 mutants were analyzed. cot-2 is allelic to gs-1 and encodes a component of the glucan synthesis process. cot-4 encodes the catalytic subunit of a type 2B phosphatase and is allelic to calcineurin (cna-1). cot-5 encodes a homologue of the S. cerevisiae ALG2 manosyltransferase-encoding gene, a component of the dolichol pathway. A group of five non-allelic Neurospora crassa colonial temperature sensitive (cot) mutants was described by Garnjobst and Tatum (1967). The cot-1 gene was found to encode a Ser/Thr protein kinase (Yarden et al. 1992) which is the founding member of the NDR kinase family. The nature of the cot-3 defect has also been analyzed and the cot-3 gene was found to encode protein elongation factor 2 (Propheta et al. 2001). In order to expand our understanding of the genetic defects that can confer abnormal hyphal elongation/branching patterns, we have performed morphological and genetic analyses of the three remaining cot mutants isolated by Garnjobst and Tatum. We found that even though they all exhibit compact temperature-sensitive macroscopic colonial features, their microscopic hyphal morphology and branching patterns differ. Furthermore, the genetic defects involved in conferring their phenotypes include both regulatory as well as structural factors, all of which are required for maintaining proper hyphal elongation and branching patterns. Confocal microscopic examination, using the membrane-selective dye FM4-64 (as described by Hickey et al. 2005) of Neurospora crassa wild-type (74-OR23-1A; FGSC987), cot-1 (FGSC 4065), cot-2 (FGSC 1512), cot-3 (FGSC 1517), cot-4 (FGSC 3600) and cot-5 (FGSC 1362), revealed significant morphological differences between the different strains (Fig. 1). Figure 1. Morphology of wild type and colonial temperature sensitive strains of N. crassa at permissive (24 oC) and restrictive (37 oC) temperatures. Fungi were stained with FM4-64 and imaged using a confocal microscope. (a) cot-1 grown at 24 oC; (b) cot-1, 37 oC; (c) wild type, 37 oC; (d) cot-2, 24 oC; (e) cot-2, 37 oC; (f) cot-3, 24 oC; (g) cot-3, 37 oC; (h) cot-4, 24 oC; (i) cot-4, 37 oC; (j) cot-5, 24 oC; (k) cot-5, 37 oC. Bars are 50 um. As the morphological features of cot-1 and cot-3 have been studied in depth (Collinge and Trinci, 1974; Collinge et al. 1978; Propheta et al. 2001), we focused on the quantification of the observed differences on cot-2, cot-4 and cot-5. Hyphal extension rates of cot-2 cot-4 and cot-5 were measured on a standard solid medium at permissive and restrictive conditions. All of the mutants exhibited a significant reduction (75 to 99%) in elongation rates (to 0.15±0.03 mm/h, 0.27±0.05 mm/h and negligible elongation for cot-2, cot-4 and cot-5, respectively) and an increase in branching rates when cultured at the restrictive temperature. Even though the mutant's phenotypes are clearly temperature sensitive, we found that their branching rates were significantly higher (60 to 160%) even at the permissive temperatures (Table 1). For the most part, the hyperbranching patterns observed are lateral, rather than apical (Watters et al. 2000). Nonetheless, some apical/dichotomous branching was evident in the cot-5 strain (regardless of temperature; Fig. 1j-k). Table 1. Average length between branches of cot-2, cot-4, cot-5 and the wt strain grown at permissive (25 oC) or restrictive (34 oC) temperatures. We cloned the three genes by complementation (Davis 2000), utilizing the Orbach/Sachs N. crassa genomic DNA cosmid library (Orbach and Sachs 1991). The cot-2 and cot-4 genes are unlinked. However, as both genes reside on linkage group V (Perkins et al. 2001) the same complementation strategy was employed for identifying both genes. A single cosmid (G23:G5) capable of complementing the cot-2 phenotype was isolated from a cosmid library that had been assigned to linkage group V. A 6kb HindIII fragment isolated from the cosmid was sufficient to complement the mutant. Sequence analysis of this fragment revealed the presence of a single predicted gene encoding a protein designated GS-1. GS-1 has been shown to be required for beta (1,3) glucan synthase activity in N. crassa (Enderlin and Selitrennikoff 1994). During the course of the complementation experiments, we determined that a DNA fragment encoding a C-terminal-truncated version of the gene (corresponding to a gene product 188aa shorter than the original protein) was sufficient for complementation of cot-2. The mutant cot-2 allele was amplified (using primers ACCTGTAGAAAGCGGAAAGT and AGCCGTGAGAGAGGTTGT) and sequenced. A single C to T substitution in codon 167 resulted in a Ser to Phe substitution of a residue found to be identical (and within a conserved region) in 6 other fungal glucan synthases. This substitution is likely to result in impaired glucan synthase activity. This is supported by the observation that in addition to the hyperbranching phenotype, cot-2 also exhibited significantly higher sensitivity, with respect to the wild type, to the echinocandin glucan synthase inhibitor caspofungin (Kurtz et al. 1996), as extensive hyperbranching of the cot-2 mutant was evident in the presence of 0.01ug/ml caspofungin, at permissive temperature, whereas a ten-fold higher concentration of the inhibitor was required to induce a comparable phenotype in the wild type. The fact that caspofungin-induced hyperbranching was observed in the cot-2 mutant even at 25 oC strongly suggested that glucan synthase activity is lower in this strain, even at the permissive temperature. GS-1 has been shown to be involved in beta (1,3) glucan synthesis of the fungal cell wall. Based on our analyses, a truncated version of the gene was sufficient for complementation of the elongation/branching defect of cot-2. When first describing gs-1, Enderlin and Selitrennikoff (1994) stated that a truncated (≈140 amino acids shorter) wild type gs-1 allele was sufficient for complementation. In this study we found that even a shorter version of the gene is sufficient. The apparently unnecessary C-terminal region of the protein may be involved in additional cellular functions not examined in this study. Support for this possibility can be found in reports suggesting that the role of the S. cerevisiae SM1/KNR4 homologue of COT2 is, most likely, regulatory (Martin et al. 1999), and that on the basis of additional analyses in yeasts (Dagkessamanskaia et al. 2001), it is conceivable that COT2 participates, via interactions with several proteins, in additional cellular processes. Other alleles of cot-2/ gs-1 have been identified in an additional screen (Seiler and Plamann 2003). However, the genetic nature of the defect in these additional mutants has yet to be elucidated. Figure 2. 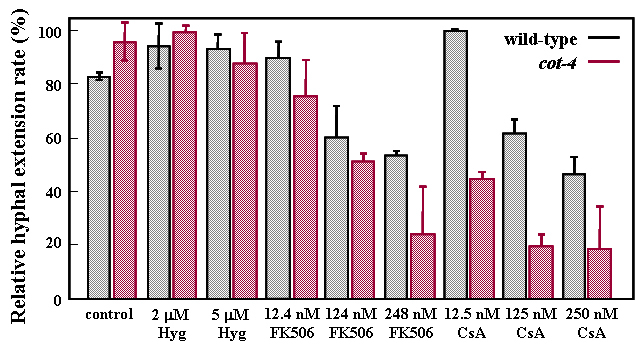 The effect of two calcineurin inhibitors, FK506 and Cyclosporin A (CsA), on the relative hyphal extension rates of wild type and cot-4 colonies grown on a solid medium at 24 oC. Hyphal extension rates were determined by the change in colony diameter over time. Hygromycin B (hyg), a general protein synthesis inhibitor, was used as a control. Bars indicate standard deviation based on a 6 replicate experiment. The cot-4 mutant allele was amplified (using primers ACCCGGTGACTTTTATGCAG and TTGGCGAGCTATTCGATCTT) and sequenced. A single C to T substitution in codon 25 was found in the mutant allele. This mutation results in a Pro to Arg change in a residue that is highly conserved within fungal calcineurins, but variable in many higher eukaryotes. Complementation of the N. crassa cot-5 mutant was assisted by the fact that a chromosome walk had been performed in the vicinity of cot-5 (Saupe et al. 1996). A 3kb SacI/ HindIII fragment, encoding NCU03503.3, a homologue of the S. cerevisiae ALG2 gene encoding a mannosyl transferase (Jackson et al. 1993; Borkovich et al. 2004), isolated from cosmid G20:11 was sufficient to complement cot-5. Based on a sequence comparison between the mutant and wild type alleles of cot-5 (amplified with primers GGTACCATGATGATGATGAGGC and GGAGACGCAAGCGGCTATG), the mutation responsible for the cot-5 phenotype resides in codon 37 of cot-5. The C to T transition in the mutant changes the wild type CAG codon (encoding glutamine) to an amber stop codon (TAG). This stop codon resides in a highly conserved part of the protein. Additional support linking the morphological defect with impaired N-glycosylation was obtained by applying Tunicamycin, an inhibitor of the dolichol pathway (Kukuruzinska et al. 1987) to wild type and cot-5 cultures. At concentrations of 4 to 10 ug/ml, Tunicamycin was able to induce hyperbranching in a manner that phenocopies the morphology of cot-5. Thus, it is quite possible that the cot-5 mutation results in reduced glycosylation efficiency. Our results suggest a connection between a normally functioning N-glycosylation pathway and proper hyphal elongation. The fact that a defect in the dolichol pathway can affect polarity is also supported by the identification of a mutant in a gene encoding an additional mannosyltransferase, NCU07261.3 (a homologue of the S. cerevisiae Alg1), which, when mutated, confers a temperature sensitive colonial growth phenotype (Seiler and Plamann 2003). We suggest two possible explanations for the link between the genotypic defect found in cot-5 (amber codon at amino acid position 37) and the temperature sensitive phenotype: (i) it is possible that premature translational termination occurs, indicating that COT5 is partially redundant. If that is the case, perhaps an additional manosyltransferase within the dolichol pathway can compensate, in a limited and temperature-sensitive manner, for the lack of COT5 function (two such candidates are the structurally-related NCU03317.3 and NCU00163.3, which are similar to the S. cerevisiae Alg6 protein); (ii) as amber suppressors can be obtained in N. crassa (Fang et al. 2002), it is conceivable that such a mutation accompanies the cot-5 strain, resulting in a full or partial readthrough despite the amber codon. The cot mutants were originally isolated by the fact that they showed colonial growth at 34 oC (the optimal temperature for N. crassa growth), but improved growth at a lower temperature (24 oC). 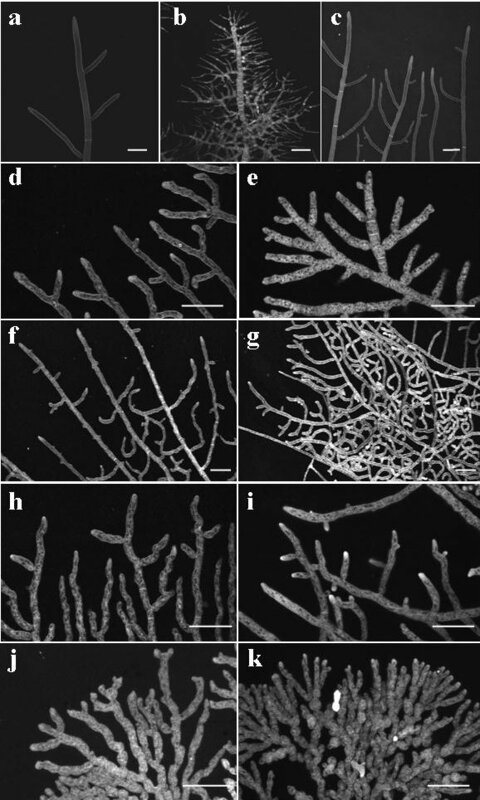 Despite the improvement at permissive temperatures, the hyphal elongation/branching rates exhibited by some of these mutants at the permissive temperature are significantly different from the wild type under the same conditions. Nonetheless, the assumption that the phenotypic severity of such mutants positively correlates with the increase in temperature may not necessarily be accurate. Though not tested in this study, it is highly possible that phenotypic changes with temperature are incremental (rather than directly proportional). It is also possible that lowering the temperature to sub-optimal levels will, in some cases, also result in increased hyperbranching as it occurs, for example, when cot-5 is grown at 18 oC (Resheat-Eini and Yarden, unpublished). The comparative functional analysis of factors involved in hyphal elongation and branching within the fungal kingdom is in its infancy. On the one hand, inactivation of cot-1 homologues in several fungi (including Aspergillus nidulans, Colletotrichum trifolii, Calviceps purpurea and Ustilago maydis) results in similar defects in polarity (Buhr et al. 1996; Durrenberger and Kronstad 1999; Scheffer et al. 2005; Johns et al. 2006), suggesting that the mutations identified in the genes analyzed during this study may confer polarity/cell shape defects in additional fungi. On the other hand, even though reduced calcineurin activity has already been shown to affect hyphal polarity in N. crassa and A. nidulans, no significant effect on hyphal growth of C. albicans was observed (Bader et al. 2003), despite the protein having a clear effect on pathogenicity. Calcineurin was also shown to be required for growth and virulence of Cryptococcus neoformans at mammalian body temperature (Fox et al. 2001). In addition to affecting human pathogens, impaired calcineurin expression also affected development and pathogenicity in the polyphagous plant pathogen Sclerotinia sclerotiorum (Harel et al. 2006). Although the cot mutants were originally identified and grouped together based on their phenotypic responses to temperature, these responses are clearly the result of mutations in different genes whose functions vary immensely. Though eventual functional links between the different gene products may become evident in the future, this observation is not unexpected, given the complexity of hyphal elongation and branching and the fact that it requires the proper function of a wide array of cellular processes. This research was supported by The Israel Science Foundation.